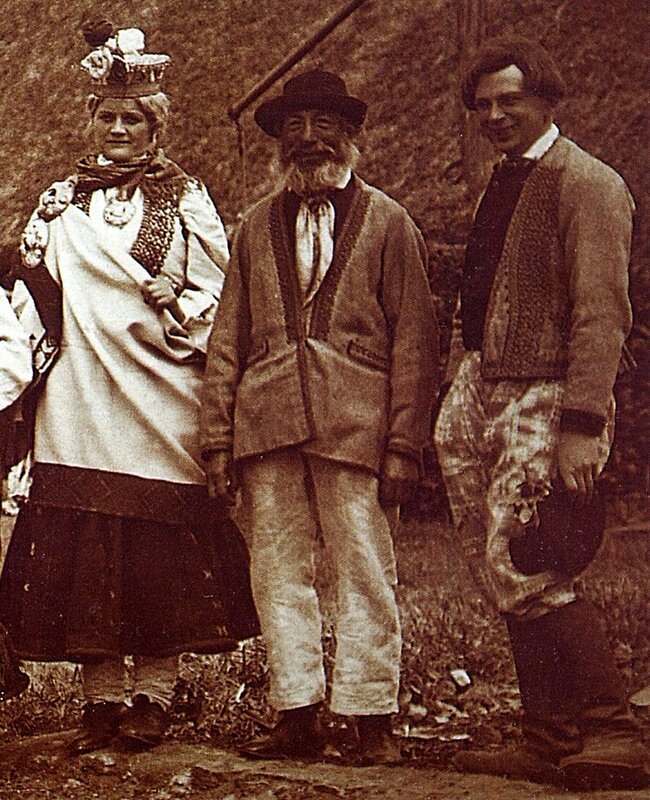 Today I will talk about the men's costume for Nica, Rustava, and Barta. Nica and Barta are each often depicted as 'The' costume of Latvia, even though they are not typical. The men's costume of these three adjoining districts is not really distinct from each other. 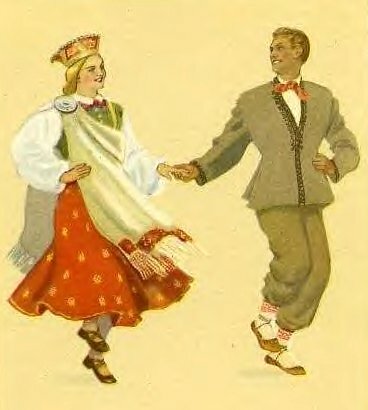 Here is the print from the series of Soviet Costumes representing Latvia that I showed you earlier. White linen shirt, gray pants and jacket, white socks over the pants [in Rucava they would have a narrower pattern than shown on the top of the stockings, and none at all in Nica or Barta], footwear, and a tie or sild kerchief around the neck. Here is part of a photograph from 1931 depicting what were then old wedding traditions from Nica. Here we see a short jacket on the groom, a somewhat longer jacket on his father? Both are of wool and embroidered in the style typical of the region. We see two different versions of tying the neck kerchief. We also see what appears to be a plain dark colored double breasted vest on each of them. 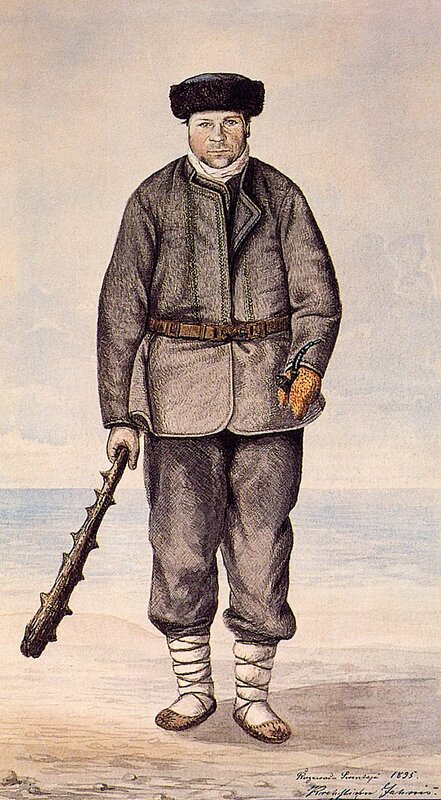 The pants are patterned linen, worn outside the socks of the one, but tucked into the boots of the other.Felt hats on both, the groom having a posy on his. Here is a painting made in 1820 of a man from Nica. ﻿Here we see the long gray jacket, kerchief [scarf?] 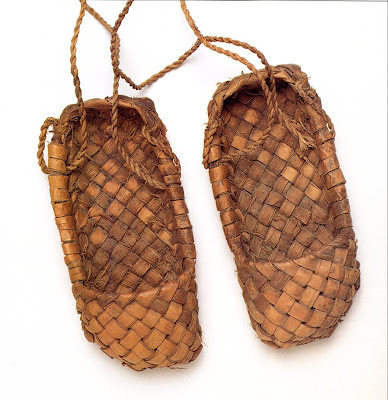 around the neck, fur hat, white socks or footcloths and pastalas [moccasins]. The gray wool pants seem to be worn over the socks. Here is another old painting of a man from Rucava. Short jacket, vest, wool pants tucked into the socks or footcloths, leather belt, and again fur hat and pastalas.﻿ There was obviously some variation in the cut of the jackets and how the pants were worn. Here is a museum display in Moscow of a 'Latvian costume'. Ok, one more photo of a man in the long jacket. He seems to have some black embroidery on his collar. The men's shirts are cut substantially the same as the women's chemises, only shorter. 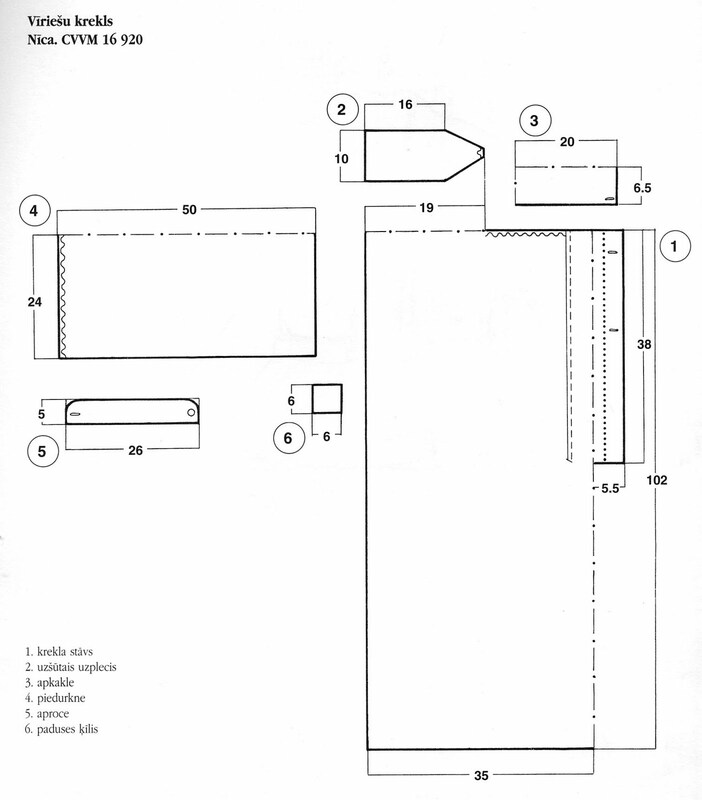 The shoulder piece is narrower, and is sometimes omitted completely. The cuff, collar, shoulder piece and sometimes the shirt front are embroidered in patterns similar to, but usually simpler, than the women's. Here is the cut. The embroidery on one man's shirt. 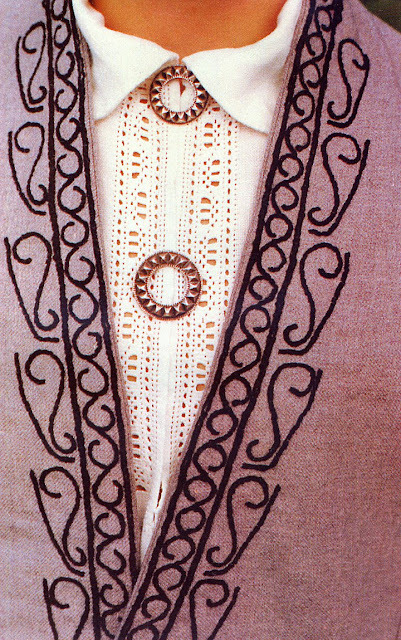 Shoulder piece, the large motifs form the center line. 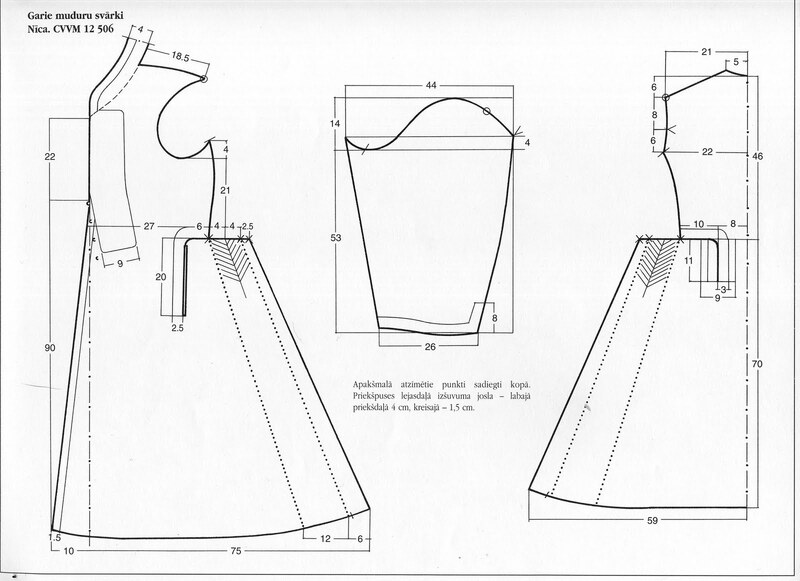 The pattern runs vertically, as on the women's chemises. 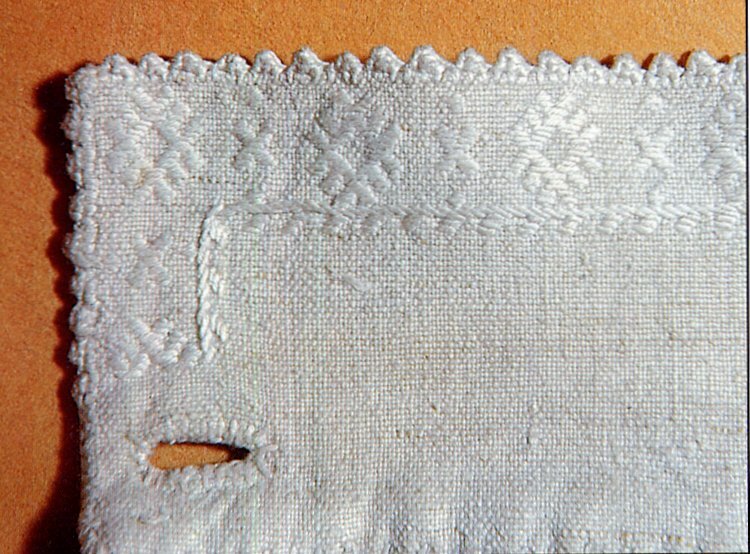 There are often loops on the edges, especially for dress shirts. Here is the front of a modern shirt used by a performing group. The shirt is held closed by a pin in the same way as the women's chemise. 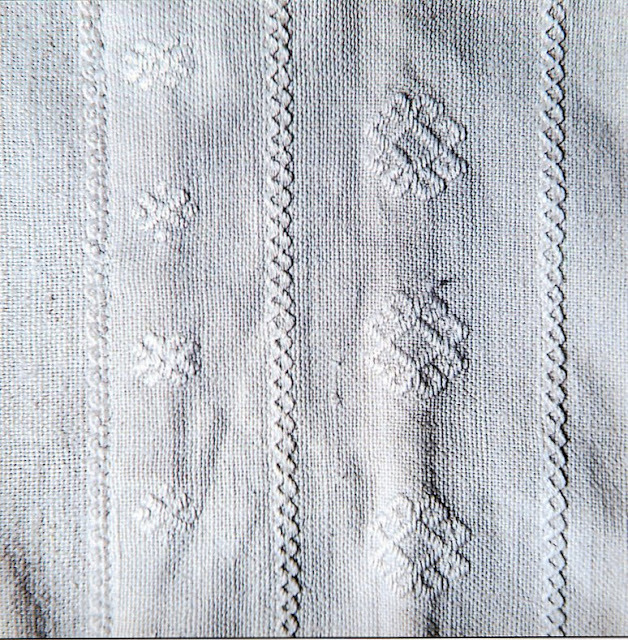 Hemstiching has been used to decorate this shirt front. They used one row of backstitch in a thick thread instead of the traditional two rows in a thinner thread. 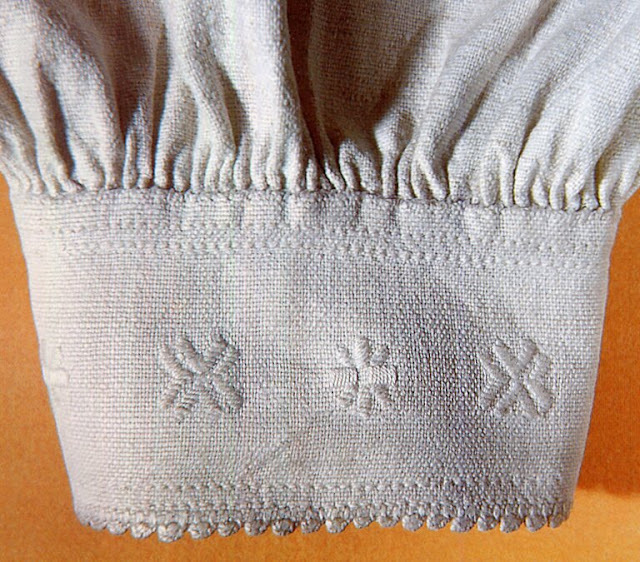 As we can see from the above photos, sometimes the silk kerchief was put around the back of the neck and tied in front, with long ends, and sometimes it was put around the front, then wrapped around both sides and tied in the front to make a short bow. In Nica, sometimes a long narrow tie was used instead, which was either cross stitched onto linen with a crocheted edge, or just crocheted. Here is a closeup of one of the embroidered ties, which match in color the mittens of the region. The v necked gray or white wool jacket, whether long, midlength, or short, had essentially the same cut. 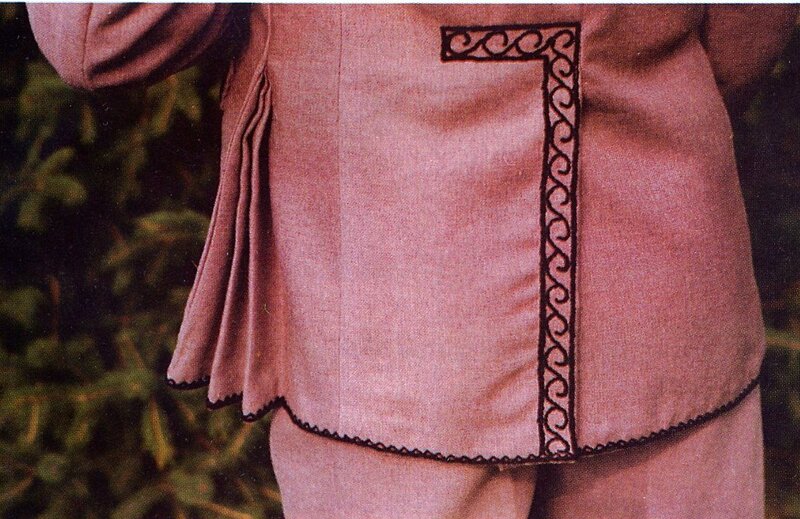 The 'wings' on the hips were folded onto themselves and pleats pressed in. Both men and women wore these jackets. Here is a woman wearing the short jacket showing the pleats on the 'wings'. 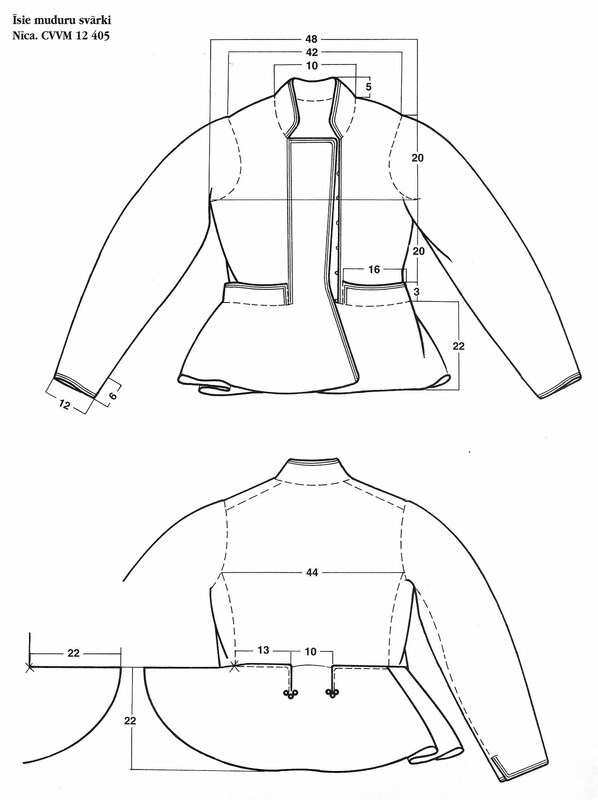 The men's short jackets were often less embroidered, and sometimes had a slit in the middle back to make 'tails'. Here is the cuff and back slit of one such jacket. 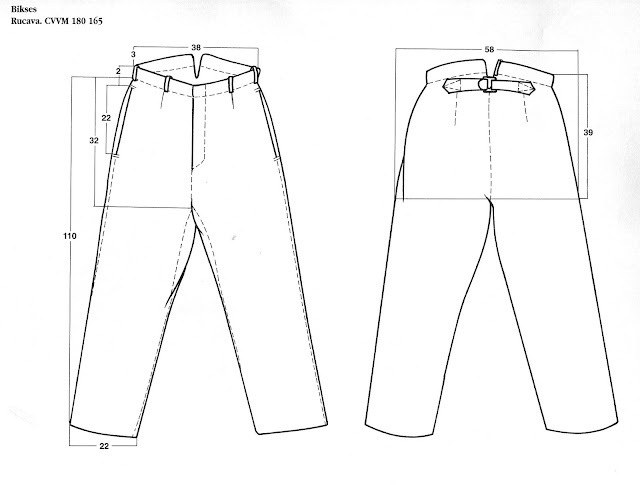 The pants were gray wool in the winter, and linen with a woven pattern in the summer. 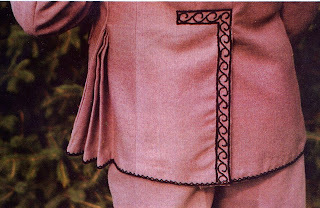 We can see two examples of the patterned linen pants in the wedding picture above. Here is another example. He is also wearing the short wool v neck jacket, and an embroidered or crocheted tie. 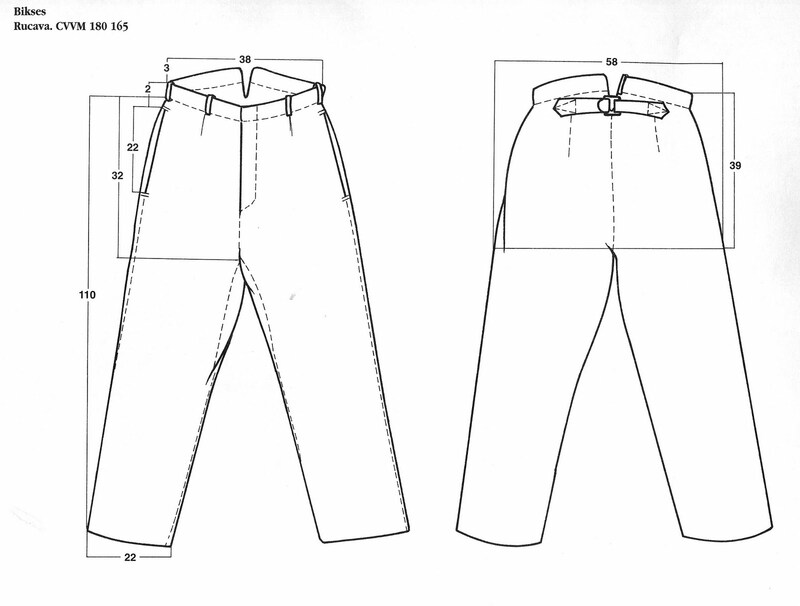 There is nothing particularly unusual about the cut of the pants. We can see in the painting of the man from Rucava above, that there also existed a double breasted cut for the jacket. 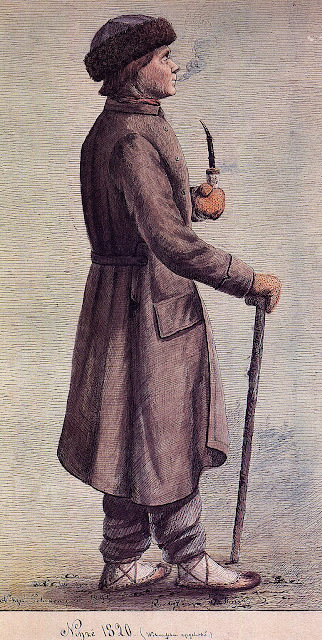 He is wearing a wool version, with a vest of similar cut underneath. The wedding photo shows the men wearing similar double breasted vests. Here is a man wearing the summer linen version of this jacket. Notice the straw hat, wich is also worn in summer, as in all of Eastern Europe. Here is the cut of this jacket. One would assume that the vests seen above were the same cut, unless they were wearing jackets under jackets, which seems quite unlikely. In this region, the jackets were held closed by leather belts with brass buckles. 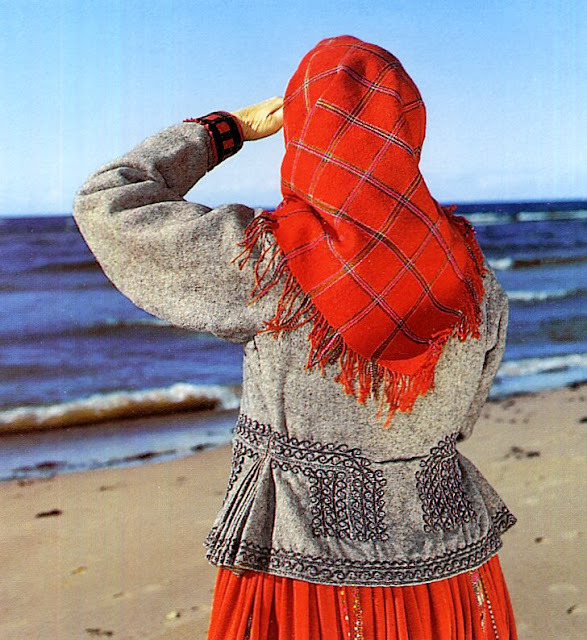 In Eastern Latvia, Finger braided sashes were used, but they are rare in this area. You can see examples above, here are a couple more. 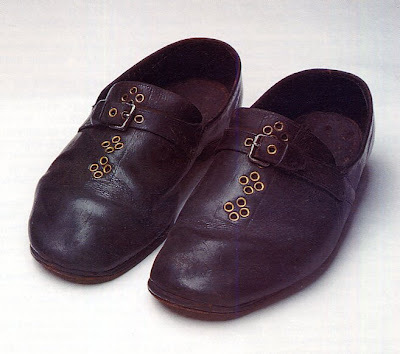 or in more recent times, actual shoes. 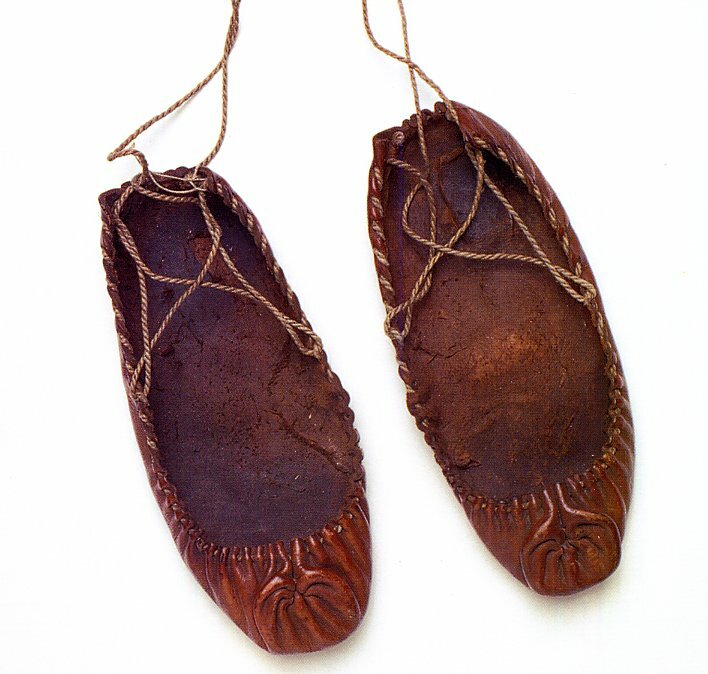 Shoes in this region are decorated with metal rivets and come in various styles. Here is one example. Thank you for reading, i hope that you have found this interesting and helpful. And perhaps even inspiring. Hello, I am wondering if you can identify what woven white piece of attire lines the inner side of my grandfather's suit coat? He was born in Russia and had lived in the Czech republic before coming to America in 1911. Perhaps this was woven by someone in his family.